The National Weather Center issued the stern warning to those living on the coast: "Those living in one or two-story single family homes must evacuate or face certain death." It was debated whether the wording was too dramatic. For some, maybe it was, but the words were sadly appropriate for what may amount to hundreds of others. Unbelievably large numbers of people did not heed the warning. They wanted to stay with their homes and be able to protect their belongings after the storm. What they didn't consider was that there would be nothing left to save, regardless of their presence. The hurricane would not make landfall until Saturday, but they didn't plan on the storm surge reaching the coast as early as Friday afternoon. With the sun still shining, the gulf waters began overtaking Bolivar Peninsula, making a last minute evacuation impossible for hundreds of people. They drank in the sight of water covering the roadways and were forced to swallow the bitter pills of regret and dread. They called for help, but only a fraction could be rescued before the winds became too strong for the helicopters. They called their loved ones and said, "I made a mistake. I'm really in trouble here." They were helpless. And their loved ones are left traumatized. Emergency operators would receive countless calls for help during the storm. They would not be able to offer any hope. It was too late. In complete and utter darkness, people were swept to sea in their own homes. Their broken, swollen bodies are currently being recovered all along the coast amid debris, alligators, water moccasins, and swarms of mosquitoes. The Houston Chronicle reports that hundreds of people are unaccounted for. You can go to their web site and search the names and faces of missing fathers, mothers, grandparents, aunts, uncles, sons and daughters. It is horrifying. In the midst of this, while many in this region remain mercifully unaware due to lack of power and/or cable TV, our country is on the verge of financial disaster. And while the coast is still cleaning up, we will elect a new president and proceed to change administrations in the middle of a war. Simply put, it is all very scary. People, look around and see that the storm surge of Hell is rising around us. It is lapping at the Sea Wall. It is beginning to flood the only road off the island. We stand on the decks of our fancy beach homes built on sand and watch the water rising, submerging the pillars we trusted to keep us safe. We've already been warned of disaster. Scripture says "All have sinned and fall short of the glory of God" (Romans 3:23). And "The wages of sin is death" (Romans 6:23). Our sin - the thing inside us that makes us do wrong - has earned us spiritual death, an eternity apart from God. Indeed, an eternity in hell. The hell on earth around us now is only a shadow of what is to come when we will reap the terrible harvest of the sin we sowed on this earth. It is a dire message. A terrible thing to have to hear. But true. My friends, the good news is that we still have time to call the Emergency Operator and ask to be saved. While the Bible says that we deserve death, it also says "But the gift of God is eternal life in Jesus Christ our Lord" (Romans 6:23). We can call upon Jesus to save us - from ourselves and from the unquenchable fire of hell that is eager to overtake us all. There is a way out, but there is only one way. "Salvation is found in no one else, for there is no other name under heaven given to men by which we must be saved" (Acts 4:12). Call on Jesus. Jesus made a way for us to be saved when He came to earth and lived a perfect life. He was fully man and at the same time fully God. He was completely without sin. He laid down His life for us while we were still doing everything wrong and spitting in His face. He loved us that much. He was tortured, then nailed to a cross and died. On that cross He bore the wrath of God for all of humanity's sin. He suffered and died in our place. He was resurrected on the third day and appeared to many men. This is one of the most well documented facts in history. All of time revolves around His resurrection. At this moment He sits on a throne in Heaven next to God. He waits for us to call upon Him for salvation, to surrender our lives to Him, to put our hope and trust in Him. Romans 9:10-12 says, "That if you confess with your mouth, 'Jesus is Lord,' and believe in your heart that God raised him from the dead, you will be saved. For it is with your heart that you believe and are justified, and it is with your mouth that you confess and are saved. As the Scripture says, 'Anyone who trusts in him will never be put to shame.'" He waits with open arms for the Saved, the Forgiven, the Rescued to enter into the splendor of an eternity with Him. There, the foundation is solid and there is no fear. There is only joy and the fulfillment of every need of your immortal soul in the presence of the One who created you. Just like the hundreds of people who died needlessly when they did not heed the evacuation orders on the coast, we will suffer in hell needlessly if we do not take Jesus Christ up on His offer of salvation. What? You think you don't deserve to be rescued? Well no one does. It is all by grace, no matter how "good" you seemed or how "bad" you were. What? You want to stay in your house and protect all that you've gathered for yourself on this earth? It will all be destroyed anyway. What? Your husband won't go with you? You'd rather stay behind with him and ride it out? How foolish. Take your children and go. Call upon His name before it is too late. Hurricane Hell is in the gulf. It is churning. It will certainly make landfall for each of us, but we are not given a forecast. We do not know when it will hit, but we do know that it brings with it "certain death." Will we say the warning is too stern? Or will we call upon the Savior and be rescued? I'm sorry, but is this not outrageously cute? Christine brought this outfit from Old Navy by today. Thanks, Aunt Fitine! Janelle and Sunni, I know y'all are happy for me right now. 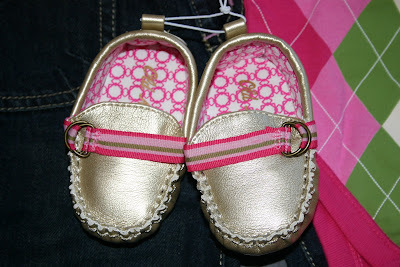 Please, God, let her feet be small enough to fit in these! I pray she does not inherit the Moore feet. Jones feet, Lord, Jones feet! Look at my happy boy with his first train set. I ended up putting the track away because it was frustrating him, but he took Thomas to his Fisher Price spiral car ramp and was as happy as could be! PS - Check out those eyelashes. 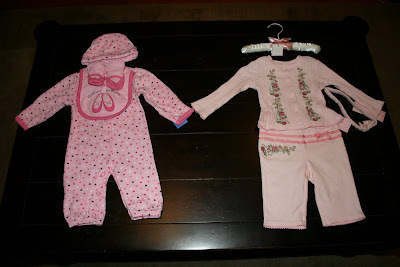 Baby Girl will be so grateful one day if she gets those! We are halfway through our week without Curtis. Today was a really hard day. "Really hard" as in no one in my family is in the hospital, we are all dressed and fed, the bills are paid, but I still had a hard time counting my blessings and not being pitiful. I cried three times. Mainly, I am emotionally exhausted with Jackson's discipline issues, which for a couple of days were intensified by the very welcome and much desired presence of my sweet friend Bonny and her two sons in our home. Bonny is like a sister to me (we lived together for three years) and both of her boys (3 years and 7 months) are precious. Here's the deal: my son hates sharing his toys. When we have other kids over, a terribly ugly side of him comes out. We've had three very tough experiences with this in the last few weeks. I can't even tell you how much this breaks my heart, embarrasses, and discourages me. The constant need to discipline him makes me feel like a mean, angry, ineffective mommy. Bonny and her boys left at lunchtime. By then I was at my breaking point with Jackson. I was in such a funk that didn't want to go anywhere or see anyone for the rest of the day. But my friend down the street had invited us to dinner at her house with some other families from our church. I wondered if we should even try to go. Maybe it wouldn't be so wise to put Jackson in another situation of sharing when we really needed some peace between us. Since I knew we could easily walk home at any time, we did end up going. It was wonderful. Jackson did great. Of course, he was getting to play with another child's toys and wasn't having to share his own. 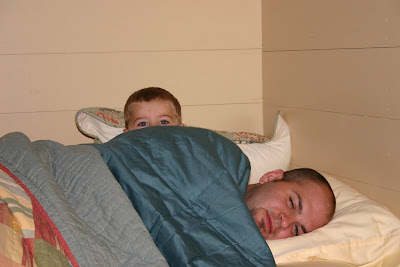 When we got home we had a very sweet time getting him ready for bed. It did some healing work on my banged up heart. I'm so glad God gave me and Jackson a chance to succeed together before the sun set on this day. If anyone reading this has ever been in my shoes, I welcome your advice. 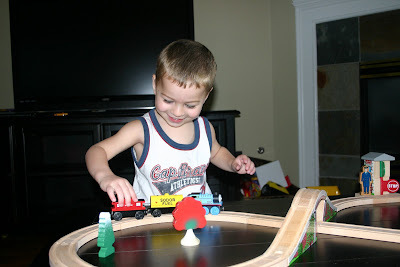 I have a very active, lively, expressive, strong, two-year-old son who can't handle sharing his toys. He shares others' toys relatively well. But I am to the point where I feel like not having company again until he's five. What is going to change his unwillingness to share his toys? Time and age? Or inviting others to our home as much as possible until he gets it right? I need some help! Well, I've gotta run. I have a date with Dobson and The Strong-Willed Child. 7:50 a.m.: First thing this morning, Jackson finds a box of "Fruit by the Foot" in his daddy's open suitcase in our bedroom. Hubs has been packing for his India trip. Jackson desperately wants us to give him these "strawberries" (?) as soon as possible. Right now, please. He runs to his high chair and puts the box on the tray. 8:00 a.m.: Not wanting to rob Curtis of even one of his precious India-snacks, I don't give in to Tachi's demands. He goes on the potty and I decide to give him one of my strawberry flavored Sour Punch Bites as a reward. Jackson, who hasn't had breakfast yet, asks for more strawberry candies...on a plate please. 9:00 a.m.: Tachi poops in his new underwear for the third time in two days. It doesn't phase him one bit. P.G. gags but doesn't surrender this morning's toast. She's got skills. 11:45 a.m.: Curtis brings home Chick-fil-a for lunch which, oddly enough, I don't enjoy that much when I'm expecting. Hubs and Tachi eat Chick-fil-a quite a bit when I'm not around. Curtis gives Jackson his chicken nuggets whole and I realize he NEVER cuts them up. This goes against everything I believe in as a parent. Tachi doesn't choke. Tachi's got skills too. Not that I trust them. 1:20 p.m.: Jackson goes down for a nap and Curt leaves for the airport. There are no tears. 3:00 p.m.: Tachi wakes up 30 minutes early from his nap and I miss getting my bath. Blast! Tonight: We're going to Bibby's house to mooch some dinner, give me a reason to get out of my sweats, and give Tachi a change of scenery. 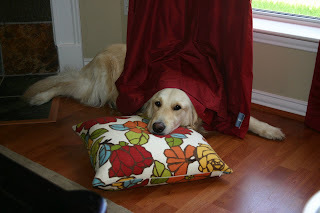 Tomorrow: Bonny, one of my college roomies, is coming to stay with me with her two boys. Yeah! Sunday morning we slept a little later than usual, swung by Shipley's Donuts and headed to church. Sunday school had been cancelled, which is totally a bummer because I love that part. I'm such a fellowship person. We entered the sanctuary and it was slowly filling up. What I failed to mention two weeks ago is that our church had just started meeting in the sanctuary again after a five-month exodus into the chapel, fellowship hall, and gym while it got a much-needed renovation. The exodus happened the second Sunday after we moved back to Houston. That first Sunday back in the new sanctuary was incredible. It was so exciting and there was a wonderful spirit of praise and thanks to God. We sang Chris Tomlin's "God of this City" and proclaimed that "greater things have yet to come, greater things are still to be done in this city." We sang it loud and proud. The very next Sunday there was no church because of the hurricane. Then there was Sunday, September 21 - only our second service in the newly renovated sanctuary. I cannot adequately describe how different the mood was in the service this week. Quiet. Somewhat broken. Sweet. Humble. Sober. Unsure. Pastor Gregg poured his heart out to love on us and shepherd us. His sermon was directly related to the hurricane and he talked about what we can learn from it. Three things will stick with me. For some people, this was a correcting storm. For others, it was a perfecting storm. And God wants to use it to shave the silliness off of our lives. When Curt and I went to the mall last week to get Baby's two little outfits after the ultrasound, I can't tell you how ridiculous and obscene it felt. Were we really at the mall when there was so much devastation everywhere? I think that is what a lot of us are feeling right now. I'm sure it will wear off for most Houstonians, but hopefully it won't wear off the Church. I certainly don't want it to wear off for me. I really need it. This is something I feel God has been doing in my life for the past little while and I want to see the work made complete. I remember when we were in England how different the elderly people were from everyone else. They had survived The War. Many had been shipped off from their parents when they were kids to live in regions of England where they would be safe from the fighting. They had been through a ton in their young years and they were not caught up in the silliness of the present-day culture. They made do with little and they didn't need extravagance. This way of being was not attractive to me at age 24. I wanted very much to project a certain image and to have as much as I could of what the world could give me, while having the things of God, too. (I'm not talking about things that are plain sinful as much as things that are permissible, but not beneficial.) I so appreciate God's patience with me at every stage of life. I also appreciate that He changes me. I am getting ever-so-close to my thirties and I'm happy that in 13 months I'll cross that line with a different heart and mind than that of my 24-year-old self. I will say the same as I enter my forties, I'm sure. Pastor Gregg exhorted us let this storm do its work in our lives - to let it be more than the inconvenience that it's been for most of us. Honestly, I haven't even been inconvenienced all that much. As he asked the congregation how many were still without power, the vast majority raised their hands. I was stunned. My cross to bear has been a tiny one. Still, He has allowed me to take a look at my own life and see the silliness, and to gaze at what matters. I want to learn this lesson. That morning we sang "God of This City" again. We did so loudly, not as proudly, but full of faith. As we sang, images of our damaged region flashed across the whole front wall of the sanctuary. Our words went up as a prayer to God. While we worshipped in our lovely new sanctuary, we knew that only a few miles away Second Baptist Church was meeting outside. Part of the dome at the top of their beautiful sanctuary had been ripped away during the storm and the damage was extensive. They are out of their sanctuary indefinitely. The body of Christ in this town is having a moment with the Lord, y'all. How I pray that the fruit will be sweet and that everyone who lives here will get a taste...and see that He is good. God, You are the God of this city. You're the King of these people. We feel broken by You but loved at the same time. Like today when I had to give Jackson a spanking for locking me out of the house while I fetched the groceries, but he clung to me for a long time afterward. I know You love us. You are not done with this city. Strengthen the remnant. Build up Your Kingdom here, Lord. Jackson's two-year-old-ness continues to bring me to my knees each day but I am enjoying him so much at the same time. It's the best of times and the hardest of times. One of the frustrating things about this stage is that I know how much he understands now and how capable he is of doing what I tell him to do. It's like he has a big flash of brilliance but then the next minute he acts completely unreasonable. The other morning I asked him if he wanted cereal or toast for breakfast. He wanted Apple Jacks* and I happily began pouring it in a bowl for him. 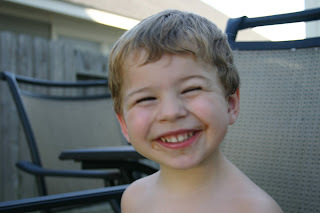 All the while he stood beside me and descended into hysterics, saying, "I want cereal (cersh)!" I kept telling him I was making it for him - and he could see it with his own eyes - but he just wouldn't be reasoned with. I was totally amazed. 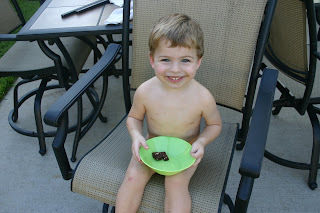 That same day he completely refused to sit on the potty at all. On the other hand, Jackson has been extra loving with me lately and I have been eating it up. He has been a daddy's boy since about 18 months but I am reaping a very sweet harvest at the moment. "Jackson, is the baby a boy or a girl?" "No, buddy, the baby is a girl!" "The baby is a girl like Ella is a girl, and like Ava is a girl." He doesn't understand yet that daddy doesn't also have a baby in his tummy. We really laugh about that but it is not going to be so funny when he asks someone else if they have a baby in their tummy. I think the baby is the reason behind Jackson's renewed affection for me. Hey, I'll take it. It's been a while since I was the favorite. He has wanted to play with my hair and sit close to me on the couch. We've been rocking in the glider every night before bed and singing songs, which hasn't been our habit for a while. (Tonight we sang the "Boo Boo Song" and the "Go Away Snake Song." So much for the Sunday school songs.) I think this new wave of affection goes both ways. When I realized I wasn't going to have another little boy, it made me want to take in the one I have as much as possible. I'm not sure how this story will come across as I write it, but I want to keep it in my heart forever. Last night we went to get some dinner at Pappasito's (which was being powered by a generator, by the way). I had been feeling like a slob so I decided to get a little dolled up. I even wore some big red dangly earrings. I normally don't wear dangly earrings because I don't particularly want them ripped out of my ears by my child. It had either been quite a while since Jackson had seen me look like that, or else he was totally mesmerized by the earrings, because he looked at me so sweetly. He grinned really big and just gazed at my face with so much affection in his eyes. My heart melted. There was nothing left of it. I got a similar reaction from his daddy, which made me feel really good. Pregnant Girl can use all the encouragement she can get from her boys. My favorite time of day is when we pray with Jackson before he goes to sleep. We always ask him what he wants to talk to God about and he says the funniest things. For a while he wanted to pray about going on the potty, but this week he has wanted to talk to God about his cars and monster trucks. Even though when he prays, he basically just repeats after Curtis or me, it is still the sweetest thing in the world to hear. Half the time I have to peek just so I can see his little hands folded. It slays me. I just love him so much. Maybe the Father sees and feels something similar when we pray. The Holy Spirit says, "Repeat after me...Dear Jesus, I love you..."
*FYI: Our son loves Apple Jacks cereal and he calls it Apple Jackson. That's because when we realized he would say "Apple Jacks" completely clearly, we tried to use it to make him say his name correctly instead of shortening it to "Tachi." It totally works! Tachi is the unfortunate byproduct of me calling him Jacksie, which is not a nickname I mean to call him or that I like to admit to calling him - it just comes out of my mouth. I know it's awful. I'm so ashamed. 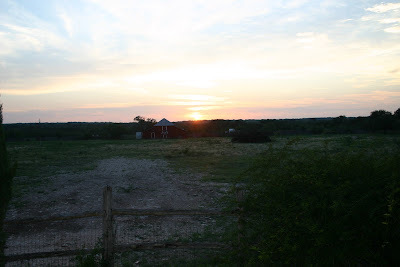 I have a few pictures from our hurrication at the ranch in west Texas. It is seriously in the middle of nowhere. How else could we go a full 48 hours without seeing anyone we weren't related to? That's probably why the polygamists chose to make their home in west Texas. The compound is actually only an hour away from there, I think. Anyway, deer hunting is the whole purpose for this ranch. My mother, sister, and I have no desire to hunt or be around hunting, so dad renovated the old (uninhabitable) ranch house and made it cute and comfy enough for us to want to come there. It reminds me a lot of our Irving house (it's about the same age). We love it! The stove is from the 1920's, the fridge is red and old-looking, the cupboards are filled with every color of Fiestaware, and some of the kitchen windows have brightly colored stained glass. It is too cute! Too bad I never took any pics of it! Next time. -Jackson wakes up with the sun. Mommy gets up with him. Bibby makes breakfast. The men sleep. Mommy skips her quiet time because she is out of her routine and undisciplined. She later regrets it. 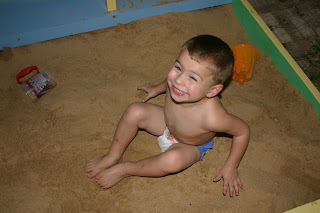 -We go outside after breakfast and sit on the porch while Jackson plunges into the dirt, dust, and rocks. He remains dirty until his bath at bedtime. 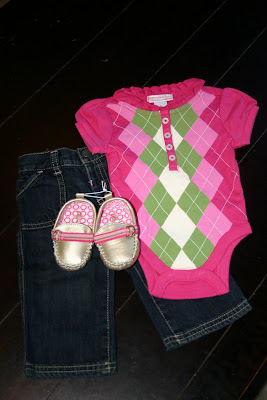 -I scold the dogs for jumping on me and getting my pajamas dirty, which were my outfit for the day. -When it gets hot, we go inside and cool off. -When Jackson gets antsy, we go outside and sweat again. -We take Jackson and Starzy for a ride in the golf cart. We see tons and tons of butterflies. And cactus. And armadillos. And some deer. And wild turkeys. -Bibby makes us grilled cheese sandwiches for lunch. -Jackson goes back outside with Daddy. Mommy watches CNN obsessively. -Parents cook an amazing dinner. -Jackson goes to bed. Mommy watches CNN and bites her fingernails. The exception was Sunday. That morning we decided to go into town and go to church. The church reminded me of a West Texas version of our church in the UK. We loved it. Then we went to eat at one of the two restaurants in town. It was very good and it had wi-fi. I was in major internet withdrawal by that time. Now onto the pictures. 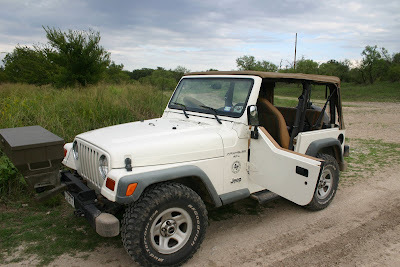 This is the old Jeep that lives at the ranch. Do not be fooled by the good paint job because the inside is very rustic (dirty). Melissa and I would have died over this in high school. It has a contraption on the front that drops corn here and there for the deer. Then you can hide out and watch the deer eat the corn. Dad and I call this the "corn pooper." Mom doesn't like our humor. Wouldn't Lis and I have been cool driving this Jeep - Corn Pooper Edition in high school? When my dad suggested a ride in the Jeep, you should have seen his face when I asked Curt to put Jackson's car seat in it. It was such a classic butting of heads between the two of us. He thought I was worried about getting pulled over and ticketed by police on our own land. I can understand how stupid that sounds. But I was really just worried about the Jeep rolling over and my child not being secured. The car seat did not make it in. We ate VERY well, thanks to mom and dad. This was steak night. 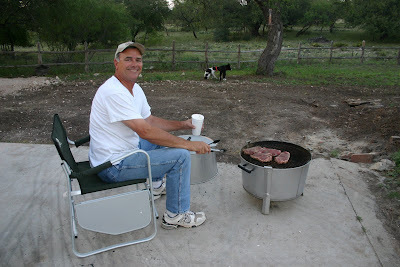 Most of our dinners were cooked on the Old Smokey or whatever it's called. Mom made me chicken and dumplings on the last night. I won't tell you how many servings I had. Let's just say MANY. Listen, I'm pregnant and mom only makes it a couple times a year. Late that afternoon we knew our house had power and we could head home, but I didn't want to miss my soup. So we stayed. Me and my daddy. Please forgive my roots. The roots on my head. Not my relations. Geli and Star, a.k.a. the Foxy Possum. Both girls are b-a-d, but who is the baddest of them all just depends on the day. They are actually really fun and they love, love, love the ranch, as does Beckham. The house has a big, fenced yard that is perfect for dogs and little boys. 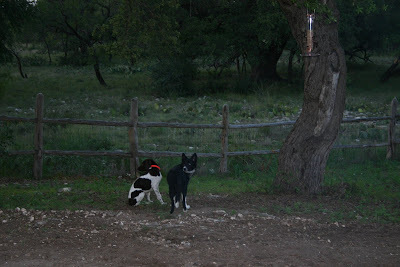 The three dogs are very useful for (hopefully) scaring away rattle snakes that may have dared enter the yard. 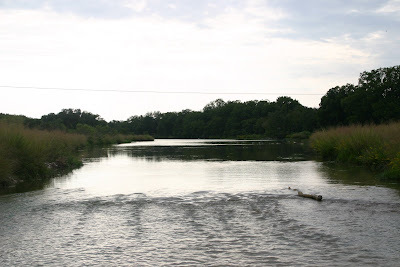 The San Saba River. We went down to the river one evening to splash around. Mom and I put our chairs in the river and visited while dad, Curtis, and Jackson actually got in. Jackson hurt his foot on a rock (he had on his Crocs but they didn't help) the first 10 seconds in the river. After that, this was as far in as he would get. 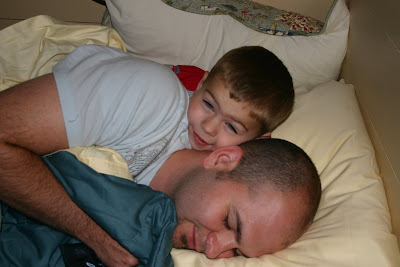 Daddy and Jackson snuggling early in the morning. Mom was going crazy over this sunset, so I took a picture for her. Notice the old barn on the left. It's pretty sweet. You can see the barn better here if you enlarge the picture. Did I mention it houses a family of bats and part of it will serve as a deer cleaning station in the future? Gross. Dad, seriously, where are the hay and horses? JK, you know I love it. WHAT?!?! We can't believe it! But we are so excited! Boy or girl? We find out tomorrow. I might not sleep tonight! ...A beautiful house that is still standing. Windows that are where they should be. Trees that are still in the ground. Patio furniture that we forgot to put inside that didn't become projectiles. Electricity that is cooling my house and letting me get online. ...A husband who boarded up our windows, who drove us 7 hours to West Texas and back, who was in a small house with my family for 5 days and had a great attitude the whole time, who let us stop every hour on the way home to have mercy on my pregnant bladder, who cleaned up our yard after an already long day, who loves me and Jackson and especially Jesus. 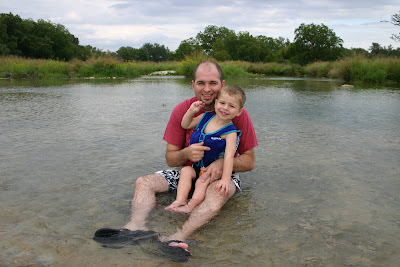 ...My two-year-old who was a super champ on our long road trip, who was happy (if not always obedient) the entire time we were at the ranch, who is so stinking funny, and who is so sweet to snuggle when he's just had a bath. ...My parents who showed us amazing hospitality at the ranch, who served us and loved us tirelessly, and who never made us feel like we were exhausting them with our...energy. They are awesome. We get to return the favor tonight since they don't have electricity yet. ...God giving us the chance to detach from our possessions and think about what is really important. And for the opportunity to consider whether I would still praise God if I returned to my home and found that it had been flooded, destroyed by fire, looted, or swept away in the wind. I hope that I will be faithful to praise Him if I'm ever counted among those who have lost everything. Well, peeps, it certainly is exciting to live in Houston during hurricane season. Ike could very well send his nastiness our way but it will be late in the game before we will know for sure. So what to do? 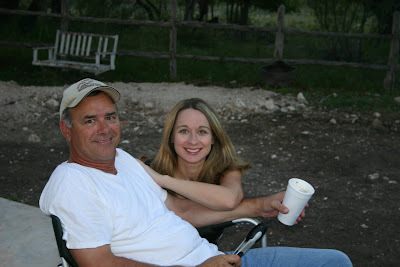 My parents have been planning all along to go to the ranch this weekend and we have decided to join them. We are going in our own car but we'll be under the same roof once we get there. 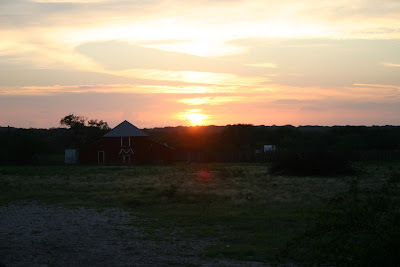 I am dreading the possibly awful traffic we will encounter on the way, but the ranch itself will be fun. We are not in an evacuation zone since we are about an hour from the water and we shouldn't have flooding. Our area could get some awful, awful wind though. If you know me well at all you know I am NOT a fan of wind. We are boarding up the huge windows in the back of the house tomorrow morning and then we will head out. I don't expect to be back online until we get home. If the hurricane doesn't come here, we will probably return on Sunday. My cell is still a Dallas-area number so hopefully if the Houston numbers jam up, mine will still work. So that's the plan, Stan! Thanks in advance for your prayers and HUGE thanks to y'all for supporting the Rescue Center in Haiti. God bless every one of you who gave and who have been praying. You guys are incredible. I just love the body of Christ! Take care everyone and I'll be in touch in a few days. *UPDATE* YOU GUYS ARE AWESOME! Thank you for being so generous! My latest count is at 38. We are so close! Can we make it to 50? You may know that Haiti has just been paid an awful visit by Hurricane Ike. Haiti is the poorest nation in the western hemisphere, so it's not like they were in great shape before that. Two of my long-time blogging friends, Jamie and Debra, are adopting children from the Real Hope for Haiti Rescue Center there. The work done at this rescue center is the real deal. Sometimes it is overwhelming to think about how you can personally help a country like Haiti, but supporting this organization is a direct way to care for orphaned and severely malnourished children. The town where the rescue center is located, Cazalle, was badly damaged by the hurricane. Their bridge was washed away, people were killed, and houses were destroyed. Thank God, the rescue center itself was not damaged and all the children were safe. Actually, one child died there that night because of how malnourished he was by the time he ever made it to the clinic. I'm telling you, these workers are in the trenches. They are in serious need of clean water and food to continue their ministry to the children and the village. With the town's bridge having been washed away, they are having to pay dearly for access to what they need. Another need they have beyond water and food is to be able to help their neighbors and workers replace things that were lost in the storm. If the Lord should impress this on your heart, please consider donating to the Rescue Center. 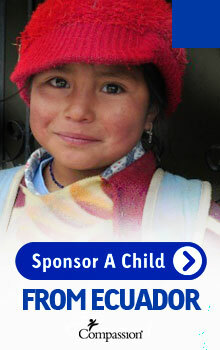 There's a button on the top right hand corner of their blog that says "Real Hope for Haiti - Donate." You can do it through PayPal. And I want you to know that I would never ask you to do something I am not doing myself. You can also find a "donate" button on Jamie's blog (at the bottom of the post I'm linking to). Jamie is challenging people to donate at least $40, which is roughly how much it will cost to have enough clean water brought to the rescue center and filtered each day until the town recovers. Thanks, y'all! ******Blame it on my pregnancy hormones, but I might just be crazy enough to think that we could drum up 50 donations from this blog. What do y'all think? Am I nuts? If you donate any amount, leave me a comment (anon. if you prefer)! Let's see what the Lord will do! LOOK! I've got the button now! 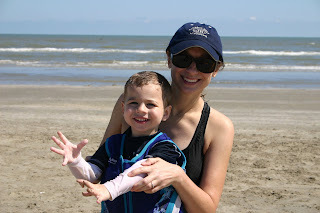 Considering how much time my family spent on the Gulf Coast growing up, I'm terribly ashamed to say that today was Jackson's first trip to the beach. I kept having to remind myself that we were in North Texas for his first two years of life. But what a great introduction it was! The weather was absolutely beautiful. 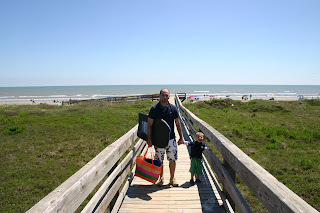 The beach was pristine and not just by Galveston standards. No seaweed, no trash, no tar, no jellyfish, no huge crowds of people. The water, which can sometimes feel like a hot tub, was a great temperature and the breeze was really nice. I even got chilly a couple of times when I got out of the water. Imagine that! I left my camera in the car for the first part of our day, but if I hadn't I would have a great picture of us eating lunch on The Strand at the Waterwall. We let Jackson throw a few pennies in the waterwall thing and he loved it. I had a shrimp po-boy and it was yummy. Also, mark it down as the first time Jackson went on the potty in a public restroom. (No more "victories" to tell about at this time.) If I could, I would also show you a picture of us at LaKing's Confectionery getting candy and ice cream and letting Jackson ride the little mechanical horse. So fun. 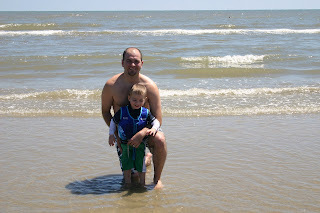 After our visit to The Strand, we drove out to Galveston Pocket Beach #3 or something like that. While I was getting our stuff organized in our spot, Curtis put Jackson's life jacket on him and headed straight for the water. Deep water. It looked deep to me anyway. 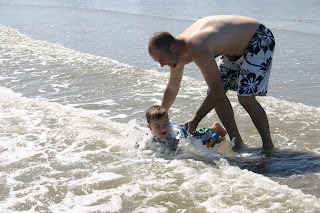 I had imagined that we would warm Jackson up to the water, especially the deeper water, but of course my two guys went straight for it. That is the difference between moms and dads. 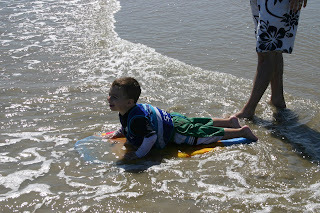 Once Jackson had had the most thrilling part, it took a lot of coercion to get him to settle for playing in the sand and splashing around in two inches of water. Another mom saw my frustration and maybe even a little fear and she, confined to the shore with her son, said "At least he likes the water." That's true, but I still don't think my two-and-a-half-year-old and his little pool life jacket are any match for the undertow. 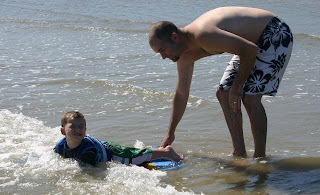 Curtis put the Mister on our boogie board and helped him "surf" in the waves. It was his happiest day. He was absolutely loving it. I almost risked my camera to get a picture but Curtis talked some sense into me. We tried to recreate the scene in shallower water for the sake of the blog, but it doesn't even compare. The pictures turned out pretty cute though. Right before the fun began. I'm so glad he's big enough to hide behind. We had the best day! Thank You, Jesus! I can't wait to go again! 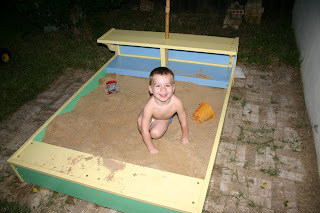 My Pappaw made this amazing sandbox for Jackson. He went all out to make it really special. Y'all, there are Texas stars under the overhang. There's also a really cool umbrella that my Memaw picked out. And a three-color paint job! It also came with wooden lids to keep the critters away. It is AWESOME! Jackson loves it! 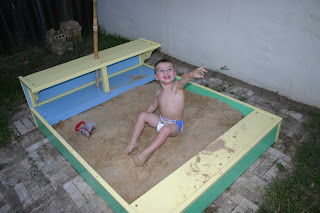 We have this random square of bricks in one corner of our yard and it turned out to be the perfect spot for the sandbox. It's also the furthest point from our back door, allowing the sand more time to fall off a certain little child before he enters the house. Amen? 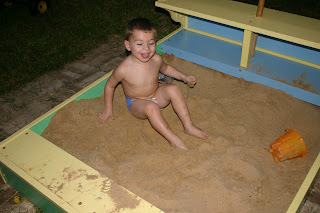 My photography tonight was awful, but I want Pappaw to be able to see how much his great-grandson loves his new sandbox. What I am lacking a picture of is the moment when Jackson chucked a handful of sand into my hair. 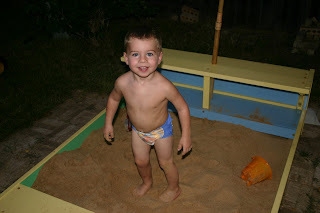 Curtis said, "Jackson, you just got sand in Mommy's hair. Do you know what you've done?" Now I know not to get too close on a clean hair day. He's waited his whole life for this! 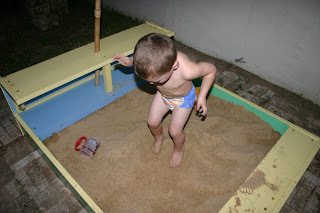 Seeing if sand is good to jump in. 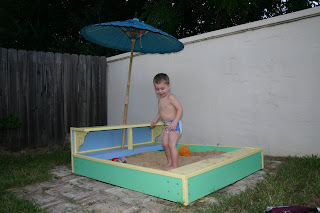 A full view of the sand box. Thank you so much, Pappaw! We love it! I was just lying here on the couch, experiencing some minor heartburn at the hand of your little brother or sister, and I was overcome by how much I love you. My sweet little man, 36 inches tall, 30-something pounds, outgrowing his size nine shoes, sleeping upstairs in his crib - a crib you are definitely getting too big for. We haven't bought your new furniture for your big boy room yet, but we plan to do that very soon. You are so big now that your nursery just doesn't feel like "you" anymore. That sounds sad, but I'm having so much fun with you right now that I can only be happy about this stage of your life and what is to come. You are a happy child (assuming you're not bored) and I think you are especially happy being two and a half. You are very strong and are coordinated enough to do all kinds of physical things. Yesterday I pulled out a ton of toys that you never play with to get ready for some friends (Allie's twins) coming over for a playdate. While I cleaned the house you played with every single thing I pulled out. You were very preoccupied but, oh my word, the whining and crying amazed me. I came to the conclusion that you just really don't like toys all that much. We couldn't even give you toys until you were 6 months old because you would get mad at them and have a complete meltdown within 60 seconds. (Somebody out there will back me up on this.) I'm just now seeing that you haven't changed much in that area. You love cars and balls, but things never seem to do what you want them to do. I think you are much happier running, playing in water, kicking balls, throwing rocks, and digging in sand. Your teachers always tell me how much fun you had on the playground running or getting dirty. It's just your thing. Every week your Bibby and Pappaw keep you one evening so Daddy and I can go on a date. Your dad and I never fail to spend a good amount of that time laughing about your antics and mimicking the things you say. God knew we loved to laugh together and He was so sweet to give us a thoroughly entertaining child. I don't know if my words have conveyed even a tenth of what I was feeling when I started typing, so I'll end by simply saying that I love you so much. I never imagined that God would entrust such a special little person to my care. What a privilege it is to be your mommy. It happened this evening in the backyard while Jackson was playing t-ball. The Diego and Baby Jaguar potty made it to the rescue. Jackson finally got to have a handful of "ice cream treats," AKA Dibs. They're chocolate covered bites of vanilla ice cream. He LOVED them. Daddy was proud. Mommy was proud. Jackson was proud. Yeah, Mister! Praise the Lord! -Our breakfast toast was on super fresh bread. Yum. -I got my license updated with my new address...five months later. -I had blood drawn by the strangest man I've ever met. I may be writing a letter. -Jackson got to talk to Ella on the phone. Ava, you're next! -I got to visit with the LPM girls during their lunch hour. -Jacks and I narrowly escaped being run over in the MDO parking lot. -This may be TMI, but I was having trouble breathing this morning and I finally realized that I may have outgrown a certain piece of clothing that was compressing my rib cage. Dang, Gina. -Curt got to feel the baby kick. -Have I mentioned how much I hate politics? I'd rather wallpaper my house with pictures of Nicholas Cage, Clay Aiken, and Donald Trump with their terribly bizarre hair than listen to all the bull flying around about both parties for the next two months. Gross. Yes, I'm going to vote but this whole process is like fingernails screeching on a chalkboard to me. I'll leave you with this silly picture of Beckham that we took last week. Jackson was cracking up about something and I looked over and saw this goober. Curt grilled hot dogs and burgers in the backyard for dinner, so Jackson had a ton of opportunity to run around nekked outside and do his thing. He played in his baby pool and kicked a ball around the yard like a pro. 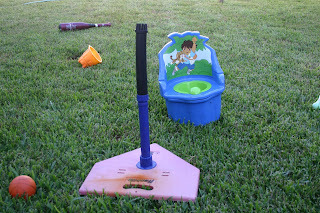 We brought the potty outside just in case. We all tried so hard. Him more than us, but the mental focus this is taking is crazy! Oh, and we were under siege by a swarm of love bugs. There's no telling how many of them died at Jackson's hand. One even drowned in the jar of relish. We ended the day with a diapered, bathed, good-smelling, however constipated child in cute jammies. It was a sight for sore eyes. I'm telling you, I saw more behind today than I ever dreamed. I kept thinking, "I see Christmas with no cakes a bakin'," which is an old saying passed down in my mom's family. Don't think too hard about it. I really don't know what most of those Arkansas sayings mean. I just say them. Also, lest you think that we are not covering our nekked child's behind in prayer, we definitely are. In fact, at night we ask Jackson what he wants to talk to God about and he says, "Tee tee and poo poo!" I am definitely praying, but I'm not so sure the Lord likes my motives. I want to get this thing d-o-n-e. But I have a suspicion that He might take His time so we can work on some of my issues like impatience, perfectionism, and being easily frustrated. Dern! I hope I learn quick!